Whether you are in need of security for your business, home or have special circumstances creating your concerns. Optimum Security can provide all of the security solutions you could ever need in the Fort St. Johns area. All of our officers receive special training and are equipped with the latest gear appropriate to their current assignment. We make a point of developing a close working relationship with local law enforcement authorities to add that little extra layer of security to assure maximum satisfaction to you, our valued customers. Read more about our Security Services here. We offer alarm and security system for both home and commercial structures. Our home alarm systems not only protect from threats such as burglary and home invasion but also monitor carbon monoxide levels, temperatures and smoke levels to protect you from fire and moisture levels to alert you to possible flooding conditions. They provide you with a hands-free, two-way communications system tied directly to our security monitoring team making it easy to call for help if needed and if you should need to be away, Optimum Security can provide uniformed security personnel to watch over your property and provide a visual deterrent. Our Fort St John Security Guards are educated, meticulously trained and very professional. The full satisfaction of our clients is our primary concern and we strive to deliver the very best security service possible. Our security personnel receives mission specific training on how to best protect property, assets, and people. Their distinctive uniforms provide a highly visual deterrent to help discourage illegal or inappropriate behavior. Through an organized system of thorough foot patrols, direct observation and the monitoring of alarm systems our personnel provide a multi layered security barrier to protect both you and your property. At the first signs of crime, inappropriate behavior or fire they will notify you, the civil authorities and take appropriate actions to preserve the integrity of your property. 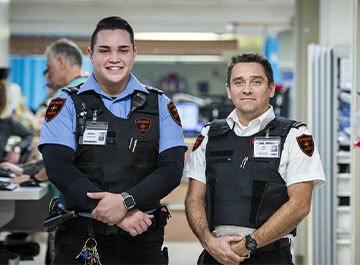 Our Fort St. John’s security officers are true professionals who have received meticulous training in how to best serve your needs. Your security and full satisfaction are our primary and only concerns and we strive each and every day to provide you with best possible security services in Fort St. John. To take advantage of our Security services, contact us today!